Susan McCreary Duprey was born and raised in Honolulu and graduated from ‘Iolani School. While at ‘Iolani, she sang under her late father, organist and composer, John McCreary. She attended Gettysburg College in Pennsylvania where she majored in Spanish. Her undergraduate studies took her to Spain and Mexico. While in Mexico, she studied voice under Tenor Flavio Becerra. Her musical studies continued at Westminster Choir College of Rider University in Princeton, NJ, where she earned a Master of Music, with distinction. She studied voice with Tenor Thomas Faracco and conducting with Joseph Flummerfelt. As a singer, Ms. Duprey sang, recorded, and toured with the renowned 40-voice Westminster Choir. She has sung with leading orchestras including the New York Philharmonic, The Philadelphia Orchestra, the New Jersey Symphony and the Orchestra of St. Luke’s and has sung under Maestros Kurt Masur, Wolfgang Sawallisch, Helmut Rilling, and Zdenek Macal. As a choral conductor, she has prepared choruses for such noted conductors as Joseph Flummerfelt, John Rutter, Timothy Sharp, and Sir David Willcocks. Works prepared included Bernstein’s Chichester Psalms, Bruckner’s Te Deum, Morten Lauridsen’s Lux Aeterna, and Mozart’s Requiem (Süssmayr). With her own ensembles, she has conducted orchestral performances of Bach’s Magniﬁcat, Beethoven’s “Ode to Joy” from his 9th Symphony (the West Hawai‘i premier), Brahms’ Requiem, Britten’s Ceremony of Carols (SATB), Forrest’s Requiem for the Living (Hawaiʻi premier), Lauridsen’s Lux Aeterna (the State of Hawai‘i’s orchestral premier), Mozart’s Requiem (Levin), Ramírez’s Misa Criolla, Rutter’s Gloria, Schubert’s Mass in G, Vivaldi’s Gloria, and excerpts from Handel’s Messiah. In January 2002, she founded the Hawai‘i Paciﬁc University International Chorale and Vocal Ensemble, the state’s ﬁrst choral program specializing in multi-cultural choral repertoire. In June 2004, she prepared the HPU International Vocal Ensemble for their Carnegie Hall debut in a musical tribute to composer Morten Lauridsen. Ms. Duprey has served as Director of Choirs at First Presbyterian Church (Honolulu) where she directed the Chancel, Handbell, and Children’s Choirs. She has also served as choir director in both Hispanic and African-American churches and performed several years with Kawaiolaonāpūkanileo, an ensemble created to perpetuate Hawaiian choral music. In February 2016, she was invited to be the headline speaker at the National Association of Church Musicians conference in Redlands, California. Ms. Duprey has also been featured speaker at events for the American Association of University Women, Rotary International, National Society of Arts and Letters, and the Association of Lutheran Church Musicians. Ms. Duprey is an active member in several professional choral organizations including the American Choral Directors Association and Chorus America. 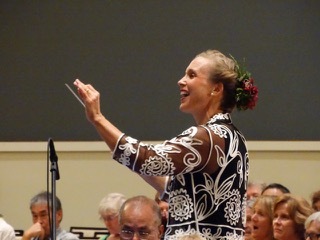 She keeps busy serving as Artistic Director of the Windward Choral Society (a chorus she founded in 2008), Artistic Director of the Kona Choral Society, and paddling with her outrigger canoe club, Lanikai Sunrise. She and her husband Bryan live in Kailua, O‘ahu.